Pick an object. Any object. It can be a skateboard or a bus seat. It can be whatever you want — as long as it’s part of our everyday culture. Now find out how it came into our lives; why we use it; how we use it; and what are the ramifications of using it. 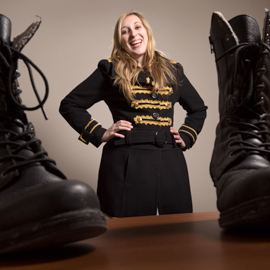 When Christine Orlowski got the assignment during her second year in the Cultural Studies program at Laurier, the answer lay at her feet — in combat boots. At the time she was a fashionista who favoured a military look. She wore army green jeans with cargo pockets. And, inspired by the Sgt. Pepper’s Lonely Hearts Club Band album cover, she added military trim and buttons to a plain black peacoat. But it was her Steve Madden combat boots that Orlowski set her sights on. She learned that the boots were worn by working class folks in Britain long before rock guitarist Pete Townshend took them onstage and kicked them into “must-have” youth culture territory. At first glance, studying cultural issues around combat boots or the lowly bus seat (an object researched by a student who commuted to school by bus) may look frivolous. But they’re good examples of a carefully considered and effective teaching strategy, said Jeremy Hunsinger, coordinator of the Cultural Studies program. “We make the knowledge about you,” he said. After all, we live our cultures. So what better way to learn about how culture works — including how it helps create and support systems that govern our everyday lives — than to begin with how culture affects you directly? “They’re all topics students like — students usually get into,” Hunsinger said. In some cases, students focus their academic attention on computer games or comics. But don’t try telling him that studying comics is not a serious pursuit. For example, think about political cartoons — which often communicate faster and more clearly than written text — that criticize abuses of power. As a matter of course, students examine the cultural factors that help all sorts of people (business tycoons, politicians, A-list celebrities) gain and maintain power. Laurier doesn’t confer a degree solely in Cultural Studies: students who take the program do it in combination with another subject, and the words “Cultural Studies” appear on their degrees alongside the other disciplines.